Surveillance of HPV Genotypes among Patients attending Hospital Facilities with High-Grade Lesions, including Cervical Cancer, in the former Transkei region of the Eastern Cape Province. Specific types of human papillomavirus (HPV) are causally associated with cervical cancer with at least 99% of cervical cancers having detectable HPV DNA. Worldwide the dominant HPV type found in invasive cervical cancer is HPV-16 followed by HPV-18, -45, -31, -33, -58, -52, -35, -59, -56, -6, -51, -68, -39, -82, -73, -66 and -70 in order of decreasing prevalence (Walboomers et al., 1999). Human immunodeficiency virus (HIV) positive women are more likely to be infected with multiple HPV types. HPV-associated cancers in HIV-positive individuals occur more frequently than in HIV-negative individuals (Frisch et al., 2000; Lomalisa et al., 2000). It is expected that the number of women with cervical cancer is going to increase as more women get access to HIV-1 therapy. While other anogenital and oropharyngeal cancers are also associated with HPV the most important burden of HPV associated disease is cervical cancer. Cervical cancer is the second most common cancer in South African women between the ages of 15 and 44 years (Jemal et al., 2013) with the age standardized rate (ASR) of 31.7 per 100 000 population. This concurs with the observation by Somdyala, et al., 2010 and 2015 in the rural Eastern Cape Province where cervical cancer was rated as number one cancer with ASRs 21.7 and 29.0 per 100 000 population, respectively (Somdyala et al., 2010; Somdyala et al., 2015). Cervical cancer incidence is likely to be underreported because the Eastern Cape Province has an underdeveloped health infrastructure. There is very little data on the prevalence of HPV and HPV types in women in the former Transkei region of Eastern Cape Province. There is no data from the Eastern Cape giving HPV typing data on normal cervices or malignant cervical lesions. The data needs to come from population based surveillance and women with cervical disease. This project is a hospital based project in women who already have disease. It is important to have a study to demonstrate distribution of HPV types in high-grade lesion and cervical cancer. This project will undertake surveillance of the prevalence of HPV genotypes in high grade cervical lesions and cervical cancer biopsies from Nelson Mandela Academy Hospital in Mthatha, Eastern Cape. A necessary part of the introduction of the HPV vaccine should be a surveillance program. The World Health Organization recommends that countries should establish surveillance programs that will monitor the impact of vaccination on the HPV types prevalence, incidence of cervical abnormalities, precancerous lesions, incidence of ano-genital warts and incidence of mortality from invasive cancer (Stanley and Villa, 2008). Cervarix HPV vaccine, vaccine used in South Africa immunization program, protection is HPV type specific (HPV-16 /HPV-18) with limited cross protection for closely related types (HPV-31/ HPV-45/ HPV-33) (Malagon et al., 2012). As part of the HPV vaccination strategy in South Africa, it is important to have baseline data on HPV so that the impact of vaccination can be assessed at a later stage. 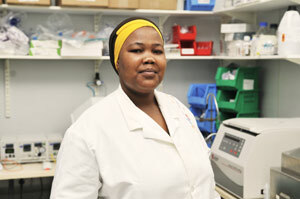 As there is no current available data on HPV types in high grade cervical lesions and cervical cancer in women of the Eastern Cape Province, this study will provide important information on HPV prevalence and distribution of HPV types in unvaccinated women with high-grade cervical lesions and invasive cervical cancers in the Eastern Cape Province. This project will also provide information on the differences in types of HPV between HIV-positive and HIV-negative women that have high grade cervical lesions and invasive cervical cancer. These data will provide the National Department of Health with crucial HPV prevalence and distribution of HPV genotypes data among non-HPV vaccinated women in Eastern Cape Province.